ST. PETERSBURG – Progress Florida Education Institute has launched a six-figure advertising campaign to educate the public and opinion leaders about how anti-abortion extremism is fueling the Zika crisis in Florida. The ads, running in various outlets across the state and social media starting this week, convey a strong message that women need medical options, not political agendas. As part of the campaign, a new website has been created that presents the facts on how anti-abortion extremism is fueling the Zika crisis. The site also provides information on a range of reproductive rights and Zika related topics including access to contraception and abortion care, support for children born with disabilities, Medicaid expansion, and fetal tissue research. “Florida women also need support for the option of continuing their pregnancy in the face of a Zika diagnosis, and that means strong social supports for families who have children with disabilities,” continued Woodall. 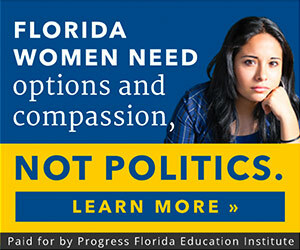 Progress Florida Education Institute believes women need the best science and research committed to a Zika vaccine and cure – not politicians who oppose promising research on political or personal grounds. Progress Florida Education Institute is a statewide, non-profit organization that engages in research, analysis, public education, and campaigns that empower our fellow citizens to better understand and impact the challenges facing Florida. To arrange an interview please use the contact information above.